The star studded event saw Host and presenter Darae Palmer and actor/comedian/presenter Robbie Gee encourage companies to intervest in the future of our young people. It was an excellent night, where £18,000 was raised to help Urban Synergy continue to raise the aspirations of young people to reach their full potential. Over 140 people attended the prestigious Thomson Reuters building in Canary Wharf on September 29th to learn about the incredible work that London organisation Urban Synergy are doing. They proudly showcased their vision of ‘Helping Young People to achieve their full potential’ before an audience of entrepreneurs, professionals and investors from a variety of industries. 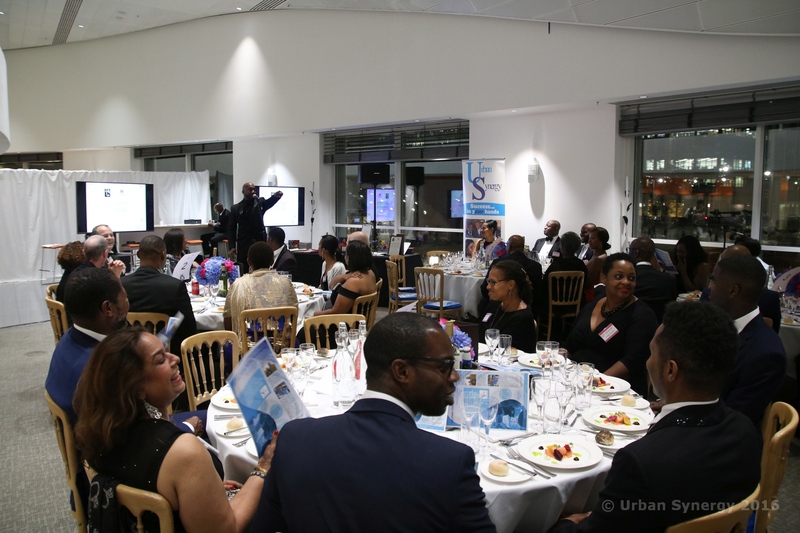 The evening boasted an impressive programme of events to help raise funds to ensure that Urban Synergy can continue to provide valuable opportunities into the next generation. The event began with a rousing welcome speech by the David Craig, President, Financial & Risk of Thomson Reuters, followed by an introduction by founder Leila Thomas and Urban Synergy’s Chair of Trustees, Courtenay Griffiths Q.C.,who expressed that Urban Synergy are seeking corporate sponsorships and private donations to support their outcome focused 1-2-1 Mentoring, Inspirational Seminars and Work Experience programmes for 2017 and beyond. Hosts Darae Palmer and Robbie Gee kept the audience entertained with a lively auction and raffle of Savile Row ties, Thriller Live tickets, Chelsea VIP tickets, Dinner at Roast Restaurant and sports memorabilia including Usain Bolt’s running spikes. The Prime Minister, Theresa May, also provided a letter of endorsement for Urban Synergy praising their work in the community. Urban Synergy is the dynamic mentoring service that operates in Lewisham, Lambeth, Greenwich and Southwark. The evening’s main sponsors were Thomson Reuters, Barclays, BT, UK Power Networks, Microsoft, Enzen and also Solomon Wifa and Michael Prest. The evening was rounded off with a stunning live performance from Brit Winner and Grammy nominee Denise Pearson and Charlene Michael-Imobioh, Thomson Reuters employee and upcoming vocalist. The stars of the show, however, were the incredible young people who attended the event to share their powerful testimonies on how Urban Synergy has changed their lives. These young people have now become Urban Synergy Young Ambassadors.